For more intricate use of the Brent Manual Clay Extruder or Brent Clay Extruder HD, we designed a tube die set to make hollow extrusions. Use these dies to extrude hollow round, hexagonal and square shapes. 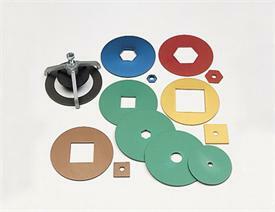 Round tubes: 3/4", 2 3/4" and 3 1/8"; Hexagon tubes: 5/8", 1 1/8" and 1 5/8"; Square tubes: 1", 1 1/2" and 2".